August is usually a busy month for a lot of folks, but this August was a whopper for me and my family. Let me start by saying I just got back from a Buck Brannaman clinic in Colorado. 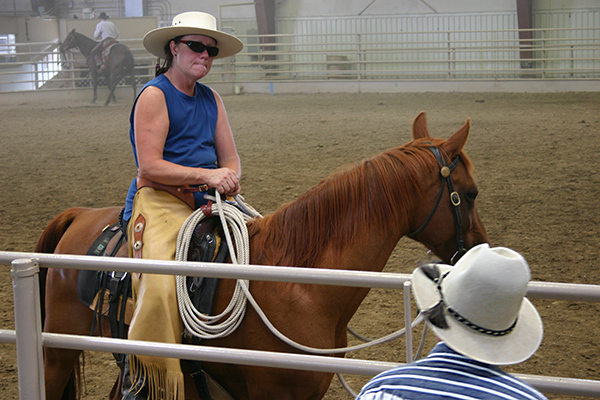 I rode Happy Jack in the level 2 horsemanship class following a level 1 class I participated in last year. People, a Buck clinic should be on every Horsey person’s Bucket list. Everyone can benefit even if you audit the clinic, you will come back a better Horseman and also be left with a little better understanding of yourself and your personality. Level 2 was such a blast, we integrated things we learned last year and practiced them with the cows, which makes it a whole lot of fun! We were divided up into teams and each team would sort out three cows and move them away from the herd, down the arena to where your Roper stood ready. 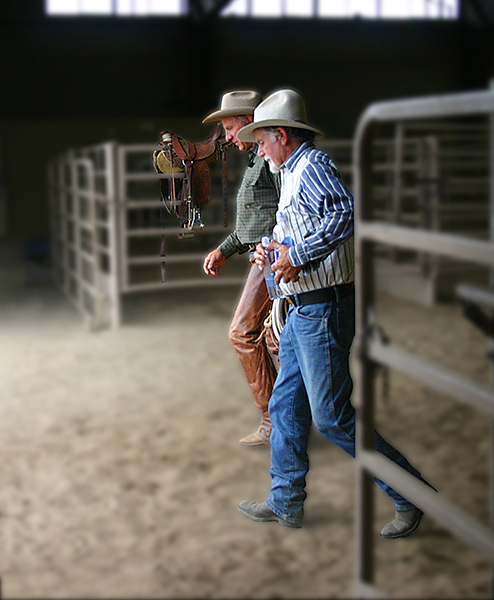 If your team made an error and didn’t set up the cows properly for the Roper, than one of your team members had to do twenty pushups, or ten jumping jacks or the guys could choose to skip across the arena! Our team of three decided we wanted no part of that, it was close to 100 degrees all four days! So, we very carefully selected our cows, and moved them down the left side of the arena, and whacko the roper made his mark! We ended up being the Champion team, not one pushup did we do. But, honestly the best part of the whole clinic was that I was able to share it with my friend Dennis Paschal who rode my young horse Rimrock in level 1. They were an awesome team and I learned so much from watching Dennis perform his magic on my buddy Rimrock. Dennis put off a long time need to have 1 kidney removed so he could attend the clinic. He is now still in the hospital recovering from the kidney operation he had on Tues just one week after the Buck clinic. He is expecting to be back in the saddle in 2 weeks, he is such a positive and optimistic person, I just love that about him. At the beginning of August, I was part of a little miracle named Rylee Faith, born August 6th at 11:29 am, 19” long, weighing in at 7lbs 5.3 oz. I received the call from my daughter, Jen, at 2:30 in the morning. I had just taken the dogs outside to perform their nightly duty and I had looked up at the beautiful sky full of stars, and just then saw 3 shooting stars in a row! I couldn’t get back to sleep something was brewing in the universe and it turned out to be the day Rylee decided to join us. I was so honored to be in the delivery room with my daughter, and was elected picture taker as the photographer need to return to work after waiting for 6 hours and no Rylee! We all thought it would be a very fast delivery but she fooled us and decided to arrive just 10 minutes from the time her sister Baylee entered into the world last year. My daughter is amazing in that she delivered Rylee practically pain free with only 45 minutes of hard labor, which I think she said ouch about 3 times is all. Lucas was so wonderful with her as he coached her through the delivery. So all in 1 month so far I had crossed off 2 things on my Bucket list! 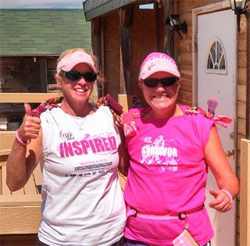 Last but not least on August 10th, my good friend Joy and I participated in the Race for the cure here in Cheyenne. It was a beautiful morning, perfect temperatures, and lots of people showed up for the cause. Joy and I were surprised when we both stopped at the outhouses and realized at the same moment there was a flyer on the doors with a picture of my daughter, my granddaughter and I last year on the cover, 3 generations! We started out with a bang, running strong, a new strategy for me as I had decided to run as fast as I could for as long as I could, not my typical turtle crawl. We ended up taking 6 minutes off our time from last year! Joy and I both felt so fortunate to be able to share this event with each other and plan to keep up the tradition of running each year for as long as we are able. Joy has Lupus and of course I have been in remission with Breast Cancer for 5 years now, we do the race because we can and so many others can not. All for now guys, I am looking forward to a quieter September of the nicest weather to ride in, and the best trails ever! 1ST. CONGRATULATION’S Grandma CJ and Grandpa Dave!!! Beautiful baby Rylee.. Along with Granddaughter Baylee..
Buck B. clinic pictures are great. Congratulation’s! Exciting.. So glad your friend Dennis is okay. Way to go on your run. Keep up the good work CJ you are a winner!!!! !